LONDON--(BUSINESS WIRE)--Technavio market research analysts forecast the global invisible orthodontics market to grow at a CAGR of close to 13% during the period 2018-2022, according to their latest report. In this report, Technavio highlights the increase in adoption of CAD/CAM technology as one of the key emerging trends in the global invisible orthodontics market. In the last decade, CAD/CAM technology has advanced and has developed a great interest in orthodontics. Technological advancements are providing new opportunities in orthodontics and enabling players to produce braces that are superior to the conventional ones. The overall shortened treatment time and less invasiveness is the main advantage of CAD/CAM technology. This technology allows the customized design of invisible braces according to patient’s oral anatomy and supports the correct placement of braces. By implementing CAD/CAM technology, players can develop advanced and innovative orthodontics that is capable of aligning a variety of designs based on the type of material, size, and color. Invisible orthodontics is mainly used for treating malocclusion or teeth irregularity, which has a high prevalence rate among all oral pathologies and is considered as the third major dental disorder after tooth decay and periodontal disorders. Several organizations and governments recognized malocclusion as one of the worldwide dental public health priorities. The growing awareness about malocclusion and the availability of orthodontic treatment will drive the market growth of invisible orthodontics. This market research report segments the global invisible orthodontics market into the following products (clear aligners, ceramic braces, and lingual braces), end-users (hospitals and dental and orthodontic clinics), and key regions (the Americas, APAC, and EMEA). Of the three major products, the clear aligners segment held the largest market share in 2017, accounting for nearly 82% of the market. The market share for this product is expected to increase nearly 5% by 2022. The fastest growing product is clear aligners, which will account for nearly 87% of the total market share by 2022. The Americas was the leading region for the global invisible orthodontics market in 2017, accounting for a market share of nearly 62%. By 2022, APAC is expected to witness the highest growth rate of nearly 2%. non-alcoholic beverages reports for the entire month. 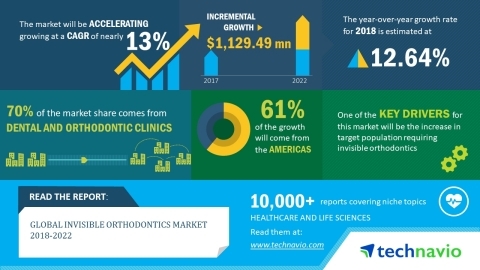 Technavio market research analysts forecast the global invisible orthodontics market to grow at a CAGR of close to 13% during the period 2018-2022.